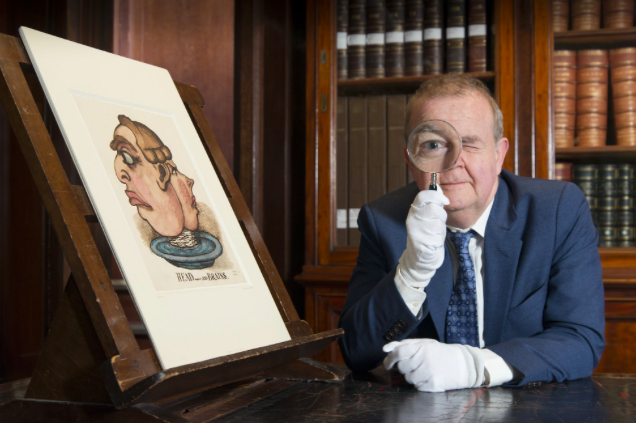 Exhibition Review: ‘I object – Ian Hislop’s search for dissent’. Are you a natural rebel? A scandal-loving scallywag? A devious dissenter? Or perfectly provocative protester? If you are, then head down to the British Museum’s new exhibition, ‘I object: Ian Hislop’s search for dissent’. Here you can discover what ingenious methods your ancient ancestors, as well as some of your more modern contemporaries, have used to challenge authority. The curator, Ian Hislop, is a Private Eye editor and ‘Have I Got News For You’ panellist – so it is fair to say, he has a finely tuned sense for satire. I thoroughly enjoyed my visit to this exhibition and I would like to share some of my favourite exhibits. One of these was a yellow umbrella. 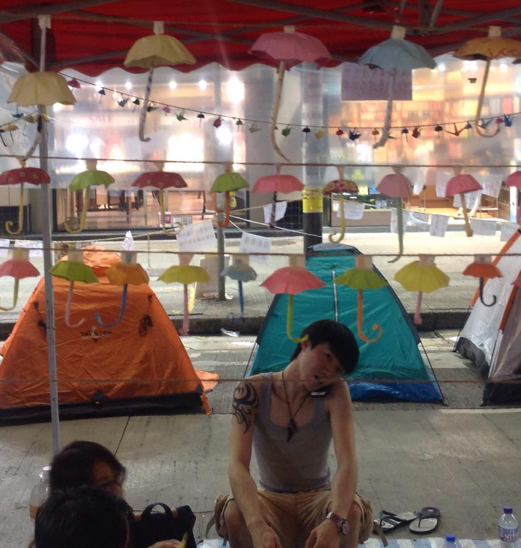 This umbrella stemmed from the Hong Kong protests of 2014. In this year, pro-democracy protesters in Hong Kong voiced their disapproval of the Chinese government’s plans for political reform. This led to violent clashes with the police. Protesters used umbrellas to shield themselves from tear gas and pepper spray during the clashes. The yellow umbrella soon became a symbol of the dissenters. My mother visited Hong Kong at this time (see photo) and I remember her mentioning something about yellow umbrellas, but I couldn’t remember exactly what. This object helped me to refresh my memory and remind me of the reason for this protest. Upon further research, I found out that there is, in fact, still considerable tension between China and Hong Kong citizens today and that a number of separatist movements have now formed. The aforementioned pro-democracy protests in 2014 actually failed, with China refusing to make any concessions. Since then there has been a growth in separatist parties, such as the Hong Kong National Party (HKNP). According to the leader of the HKNP, this is because many fear they: ‘will not get full democracy so long as their city is part of China’ (J.Y. – The Economist). Another of my favourite objects was a caricature from 1831. 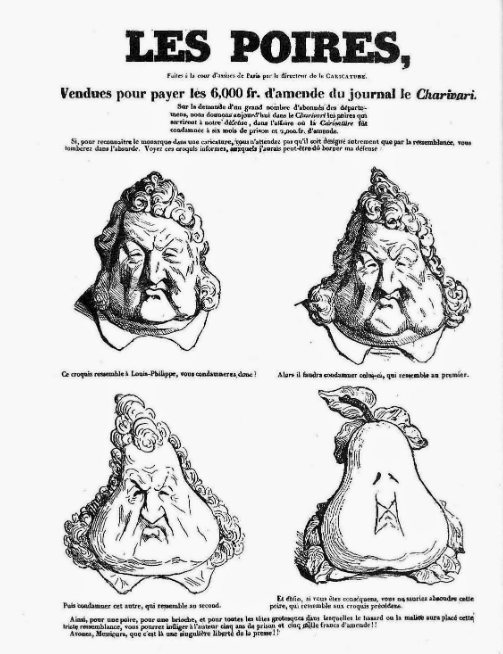 The caricaturist who created it was on trial for ‘crimes against the dignity of King Louis Phillipe I’. Presumably this means that the artist had offended the King with his drawings. The defiant caricaturist responded by releasing a new series of provocative prints. In the prints, he gradually made the King look more and more like pear. In French, the word ‘poire’ has the double-meaning of ‘pear’ and ‘idiot’, and so the meaning of the prints becomes clear. Interestingly, the joke also works to some extent in English. When something goes pear-shaped, it means that something, unexpectedly, goes wrong. Certainly, the attempts of the King to suppress freedom of speech went, in this instance, completely pear-shaped. The absolute star of this exhibition, however, has to be a work by ‘Banskymus Maximus’ (I wonder who that is!). 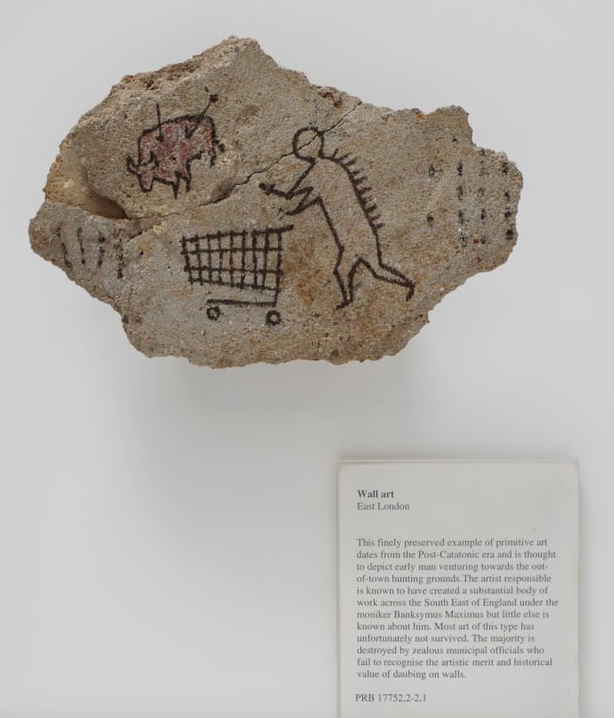 The exhibit is a rock with a drawing on it of what is, supposedly, a prehistoric figure pushing a shopping trolley out towards a hunting ground. According to the description, this is a: ‘finely preserved example of primitive art’. Of course, that is absolute nonsense – this exhibit was actually a hoax by Banksy. In 2005, Banksy clandestinely installed this exhibit (along with its authentic-looking information label) in the British Museum. It was only after a few days that the British Museum staff realized and took the exhibit down (BBC News). Banksy truly is the legend of surreptitious satire. I particularly enjoyed the way that the exhibition encouraged visitors to get involved with the exhibition. In various places in the exhibition, visitors were asked to make their own statements about political or social issues. These displays were filled with messages on issues people felt passionate about. In this way, the display boards became a kind of microcosm of civil society and the contrasting beliefs of ‘the people’. However, British culture has (perhaps somewhat lamentably) turned me into a compliant, ‘well-mannered’ woman and so I bit my tongue. Yet, surely the fact that the security guard was standing there, over-looking everything people were writing was more of a hindrance to ‘freedom of the pen’. And clearly this ‘freedom’ did not include the freedom to disagree with the views of others. Or, more sinisterly, perhaps ‘crossing out’ was only forbidden when the security guard sympathized with a particular statement. Of course, I am being very cynical here, but the security guard’s comment got me thinking about who was actually in the right here and about what freedom of the pen actually means. Who do you think was right in this situation? Answer in the comment section below. ← The Marvellous Markets of London.